Is there a place in Antonio Conte's plans for this Chelsea defender? 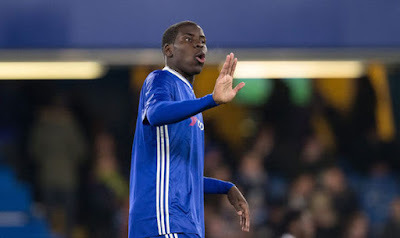 Kurt Zouma played ninety minutes last night for the Under-23's as he battles his way back to fitness. Do you see him being a part of Antonio Conte's plans moving forward? The 22-year-old French defender has battled back from a horrific knee injury that has taken seven months of rehabilitation. Up to the point he was injured, he had impressed and had made one of the two centre back positions his own playing next to John Terry or Gary Cahill as Jose Mourinho struggled with defensive stability. Now, as he fights and works hard to get back to being ready to play for the first team, you have to wonder where he would fit in at the moment. Cesar Azpilicueta has been a revelation since he moved inside to play on the right hand side of three centre backs, David Luiz playing through the middle looks solid and so does Gary Cahill on the left, we look organised and well drilled at the moment. When he is fit and waiting in the wings alongside Branislav Ivanovic and John Terry, I would imagine that it would be Zouma that would get the nod to come into the back three ahead of those two based on his pace and gives Antonio Conte an option to move Cesar Azpilicueta to right wing back if Victor Moses is injured, with Zouma coming into the team to play on the right hand side of Luiz. What do you think of Kurt Zouma's chances of getting into the Chelsea first team when he is fully fit? Make predictions to upcoming matches and see latest betting picks on Metabetting.